Maple Leafs Tryouts On Monday, Verdun Looking For NDGer's. This year's edition of the NDG Maple Leafs will commence tryouts Monday at Trenholme Park at 7:00 p.m. It is expected that three-quarters of last year's team will be back to seek a berth, although all positions are open, a spokesman for the club executive told The Monitor. The big question concerning this year's squad is who will be coach. The names of several prominent football products have been heard, including that of Johnny Hannan, but no decision will be made for at least another week. An invitation to westend footballers has been extended by Hap Holland, manager of the Verdun Bulldogs to attend the first practice and tryout on Monday, Aug. 3 at 6:00 p.m. at Auditorium Park in Verdun. Along with this invitation goes one for junior aspirants to attend the Sham-Cats first practice session on Tuesday at Verdun High at 6:00 pm. Hap Holland announces that the Bulldogs are in running for another strong squad, but that last year's line-up will mean nothing to coach Roy Chesley. Chesley is leaving all positions open to newcomers. Anyone who can is urged by Hap to show up. NDGer's expected to tryout for a place on the team this year include Jerry Casper, Haskell Blauer, George (the Golden Greek) Economides, Bobby Gibson, Alec Olsen, Doug Adrian and Westmounter, 'Biff' Byford. "Bring back the championship to NDG"
With that as their motto, aspirants for berths on this year's edition of the NDG Junior Maple Leafs have been working out nightly at Trenholme Park under the direction of head coach Solly Mastro. Solly has been at the game too long to start making predictions at this stage of the proceedings but you gather the impression that the semi-circular service station operator (Decarie and Sherbrooke--plug) is hopeful that his beloved Leafs will be back in the thick of things from first whistle to last. 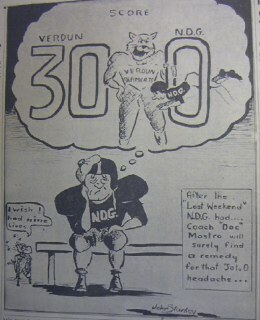 Gus McFarlane's Verdun Sham-Cats upset the Maple Leafs applecart during the regular season last year. In the playoffs the gritty Lakeshore Junior Flyers eliminated the NDGer's. The Lakeshore laddies went on to oust Verdun. This year the members of the local pigskin fraternity are confident that the Leafs will be back on top of the heap so that the newspaper boys can once again refer to the Mastro Men as "the perennial Junior kings." The coaching muddle which developed last season has been straightened out. In '52 the pressure of business kept Solly away from a number of workouts and the result was a wee too much confusion and a plethora of coaches. Solly is again head coach this year and he intends to be at every workout. Edgar Mott, the old West Hill flash of not so many seasons back and a star with the Leafs in his post-high school days, and Bill Smith, with a similar background to the Mott man's, have been appointed assistant coaches. The club drills nightly at Trenholme Park and all interested footballers are invited to turn out. Starting time for workouts is 7:00 o'clock. In the early drills, halfbacks John White and Bill Hanson of last year's aggregation have stood out along with Red Rice, snapback from old McGill, Bob Fleming, lineman Peter Woodfine, who had a session with St. Augustine's Snowdon League fastball club this summer and Ron Hutchison, signals-caller on last season's squad. A gentleman named Calder, a native of Verdun, has also caught the Mastro fancy. There will be five teams operating in the Junior section this season. In addition to the NDGer's, St. Aloysius "Little Orfuns," Verdun Sham-Cats, Lakeshore Little Flyers and Point St. Charles will be in the fold. The schedule opens at the end of the month but the Leafs have drawn a bye on the first day's activities and won't be in action until the first week of September. Donations to help defray the ever-rising expenses of the club would really be appreciated. They can be sent to; NDG Maple Leaf Junior Football Club, c/o The Monitor, 2185 Hampton Ave.
At Last week's organizational meeting of the club, C.C. Robinson was named President. Other officers elected were; W. H. Robitaille, Honorary President; G. Mantha, Vice-President; E. J. Kearney, Vice-President; Solly Mastro, Vice-President and Head Coach; Charlie Johnson, Secretary; P. Valois, Treasurer. The following were selected to act on the club's directorate: F. P. Whitman, City Councillor Roy E. Wagar; H. E. McCormick, president of The Monitor Publishing Company; A. D. Quinton, Harold Bowen, executive committee member of the Snowdon Major Fastball League; J. Hood, City Executive Committee Chairman J. O. Asselin, Paul Earl, MLA, S. Langill, Art McMahon, H. Rubin, H. L. Robitaille, City Councillor Ed Asselin, Phil Wimmer, C. Naylor, C. Kelley, F. Renault, City Councillor Ernie Mundey; City Councillor John E. Lyall; A. Grant, H. Grant, Tom Quirk, president of the Snowdon Major Fastball League; J. Latt, P.T. Lynch. A vote of thanks was extended to retiring president W.H. Robitaille. A quiet air of optimism the Trenholme Park......Solly Mastro's NDG Junior Maple Leafs these chill .......The Leafs are still in the market for pigskin material........interested in working out with the club is invited to turn up .... 7:00 pm. Mr. Mastro, the portly service station magnate, .... some of his stars to return to the city from summer ...out-of-town jobs. The NDGer's have embarked on .......already the first casualty of the season has been reported. Tom Nearing, starry inside, has been sidelined indefinitely with a dislocated shoulder. The ironic note is that Nearing suffered the same injury last year in the Leafs' final practice before their 1952 opener. Ron Hutchison, starry signals-caller, has decide to stick with the Mastro Men for another campaign. Hutch worked out with Roy Chesley's Verdun Bulldogs briefly, then decided to return to the Leafian aggregation. This will be his third season with the Leafs. Peter Woodfine, the sturdy young gentleman who had a fling with St. Augustine's Snowdon Major Fastball entry this summer, has come out of pigskin retirement and is going all-out in an effort to land a berth on the 1953 edition of the Leafs. Halfback Jim Campbell will be back in the fold this season after being sidelined last autumn with an arm injury. Halfback Bob Holland and quarterback Tim Burke have both looked impressive in drills and appear reasonably certain of latching on with the Leafs although Mastro and assistant coaches Edgar Mott and Bill Smith aren't making any definite decisions with regard to personnel for a while yet. Teddy Rice, the former West Hillian, is battling out for a snapback position. One newcomer from whom a lot is expected is Ron McEwan, all-star inside on Catholic High's Senior A squad last year. He has looked mighty good in workouts. The Leafs open their season on September 5. The Quebec Rugby Football Union rolls up the curtain on its 1953 schedule this weekend, but Solly Mastro's NDG Junior Maple Leafs will have an additional week of workouts before they undergo their baptism of fire at Trenholme Park on September 5. The four other aggregations in the Junior fold swing into action this weekend with Pointe St. Charles meeting St. Aloysius on Saturday and Lakeshore visiting Ewart Jones' Verdun Sham-Cats, last season's pennant winners, on Sunday. The Leafs were lucky enough to draw a bye and coaches Mastro, Edgar Mott and Bill Smith are determined to make the most of the reprieve. The NDGer's, who finished second to Verdun last autumn and were then dumped from the playoffs by a gritty group of gridders from the Lakeshore, have been continuing their drills at Trenholme Park. Turnouts have been better during the past week with a number of players back in the fold after being out of town on holidays and summer jobs. There's still a chance for newcomers to hook on with the club. All junior age gridders are invited to turn out at Trenholme Park any night at 7:00. Bucky "Whispers" Flynn, the Leafs hard-toiling tub-thumper has come up this week with a background data on the west enders' trio of mentors. Head coach Solly Mastro started as a guard at Catholic High and after graduating from the Durocher street centre of culture, played some standout ball for Eastward juniors. He played for Montreal Hornets and Bulldogs in the Big Four and for the strong Montreal Navy team during the war. Solly has been at the helm of the NDG Junior club since it was reorganized in 1946. Edgar Mott first came into the bolder headlines as a halfback with Roy Chesley's power-packed West Hill teams of 1943, '44 and '45. He then joined the Leafs as a player and steered for the club in 1946 and '47. In 1948 he played for Quebec Swimmers in the Intermediate loop. In 1950, '51 and '52 he was on the Leaf coaching staff and is now entering his fourth year in that capacity. Coach Bill Smith is another West Hill grad. He played for Roy Chesley's Senior A Club for three years, 1942, '43 and '44, and then was with the Maple Leafs for two seasons. In 1948 he performed for Quebec Swimmers in the Intermediate loop and in 1949 was with the Navy. He was on the Leaf coaching staff in 1950, '51 and ''52. George E. Jones, the ebullient sports editor of the Verdun Guardian, reports that both Verdun and the Point will field strong teams this season. Ewart Jones is best known perhaps as one of the city's best basketball officials and has taken over the reins from Gus McFarlane at Verdun and, according to the Jones man has won the respect of his players. H. E. McCormick, president of The Monitor Publishing Company, has been named as honorary director of the Maple Leafs Football Club for the 1953 season. Mr. McCormick brings to the post a wide wealth of athletic experience gleaned in both professional and amateur sport. Boasting a careful blend of veterans and rookies, the 1953 edition of the NDG Junior Maple Leafs will unveil themselves for the first time this Saturday at Trenholme Park when they play last season's Quebec Rugby Football Union champions, the Lakeshore Flyers. Game time has been announced as 2:00 o'clock. It was the this same Lakeshore club which upset NDG in a final sudden death playoff at Molson Stadium one chilly night last fall. In the last minute of the game, a triple threat by the name of Dave McAuley picked up a loose pigskin and ran the length of the green sward to give the plucky larrigans from the Lakeshore a one-point margin. In the final the Flyers upset the highly favoured Verdun Sham-Cats. That same McAuley will be cavorting on the Trenholme Park layout this Saturday and is the one big defensive headache for coach Solly Mastro and assistants Edgar Mott and Bill Smith. They have been preparing the team for the standard bearers and the passing, kicking and running of the fabulous Mr. McAuley. Quarterback Ron Hutchison is now entering his fourth year with the west-end squad and will be given the starting signal calling role. ......son will be at left and right half respectively. Doug Bruner will be at fullback, Stu Holland at Flying wing. Starting outside wing berths have been nailed by Alex Morrison and Tim Burke. Ted Enright and Gord Church will be at left and right tackle, at one time known as middle wings. Church was a standout with East End Alouettes last season. Emil Spehar and Armand Consenza have got the call to start as guards and Ted Rice is first-string centre. Charlie Stone, one of the super-stars on Lower Canada College's championship club of 1952, has been working out with the Leafs this week. His football plans for 1953 are still in the vague stage. Injuries have hit the Maple Leaf camp. Halfback John White is nursing a knee injury, centre Gord Patterson has a badly battered hand, and Bob Holland has been sidelined with a dislocated shoulder. These three are at best doubtful starters for the Saturday curtain riser. In Junior action last weekend, St. Aloysius edged Point St. Charles 7-6. Due to a misunderstanding, Lakeshore and Verdun did not play their scheduled encounter. The outfield stands that were moved from MacDonald Park to Trenholme to accommodate the throngs who flocked to the provincial championship fastball series, will be moved to the football field for Saturday. The Snowdon Major Fastball League sound truck will be on hand to keep fans up to date play by play. "This team has smartened up"
That was the slightly more optimistic report from rotund Solly Mastro, portly pilot of the NDG Maple Leafs after his muscular marvels had gone through another brisk workout on the Trenholme lawn Tuesday night. Mr. Mastro was by no means overjoyed with the brand of ball his charges purveyed in their 1953 inaugural at Trenholme last Saturday afternoon. That was the 7-6 shade which the Leafian forces suffered at the hands of the gritty Lakeshore Flyers aggregation that took advantage of every break that came their way. pigskin talent in the Junior society the proverbial run for their moola. The Leafs emerged unscarred from last Saturday's tussle. All injuries were of a minor nature with the happy result that Mastro hopes to be able to field his full team this week-end. The Leafs got off to a sticky beginning last Saturday. A steady rain had converted the west end pitch to a quagmire by game time. Two inches of the gooiest mud this side of the English Channel was the playing surface upon which the two clubs had to perform. That the football left a little to be desired could not be blamed on the gladiators. It was a another case of nature triumphing over man. After a scoreless and rather lifeless first quarter, the little Flyers jumped into a 6-0 lead when Gerry Apostolatos, the mercury-footed halfback who lugged leather for Westmount High ran 20 yards on an end sweep to pick up the first TD of the soggy afternoon. Trusty Dave McAuley, the Flyers triple threat backfielder, added the extra point. The score stayed at 6-0 at the half. Old Solly seemed to have instilled some type of ultra-effective elixir into the Leafs during the half-time interval. The NDGer's took full command of the game in the third quarter, unveiling one of the most powerful ground attacks seen in these parts for many a moon. Sparked by Ron Hutchison and Bill Hanson the Leafs marched 65 yards to the Lakeshore three-yard line. The locals failed to pummel their way across the payoff stripe on three tries but an offside penalty called against the Flyers gave the Mastro Men a fourth chance and this time they made no mistake, Don Brandstetter bulling his way across for a five-pointer. NDG's convert attempt went to naught. The boys took too long to get the ball into play, a failing that cost them a split of the day's points. Before the quarter had ended the Leafs had marched to the Lakeshore 25. A field goal attempt went wide of the mark but rolled across the deadline for a single point. That made it 6-6.
through for the little Flyers with a hoof that gave the visitors the one point they needed to win the game. NDG were without the services of halfback Bob Holland and tackle Gordon Patterson last Saturday. Both are expected to go against the St Als this Sunday down at Maisonneuve ....Roddy McKeown and Keith Samuels were banished from the mud battle in the second quarter for fighting.... Ron Hutchison, Peterson, Ted Rice, Bill Hanson and Johnny White were the pick of the Leafs in the 1953 opener. City Councillor Ed Asselin got the season off to a fine start by kicking off with fellow Councillor Ernie Mundey holding the ball .... Considering the miserable stuff served up by the weatherman, the crowd was a good one .... The team should hit the win column come the sabbath. Bucky "Whispers" Flynn, the hard-working, tub-thumping publicist of the NDG Maple Leafs, was in a considerably happier frame of mind than last week. "Whispers was singing the praises of Al Beaubien, the rugged backfielder who emerged as the super-star of the teams 14-10 verdict over the St. Aloysius Orfuns. Whispers who cheered Mr. Beaubien on during the summer while participating for St. Augustine's Snowdon Major Fastball League team, has labeled the big fellow one of the best Maple Leafs in many a moon. Monsieur Flynn predicts that the Beau will be much better Sunday when the NDGer's meet Verdun for a scheduled game with the vaunted Verdun Sham-Cats. The NDGer's developed quite a rivalry with the tabbies last year when the Verdunites shaded Solly Mastro's forces in two regular scheduled jousts. The Sham-Cats finished at the top of the heap in 1952, the Leafs second. In the playoffs, both clubs were sent reeling to the wayside by the lakeshore Little Flyers. According to all the information that Mr. Mastro's scouts have been able to accumulate, the Cats have come up with another powerful contender. Handled this year by Ewart Jones, a gentleman better known as a whistle-tooter in Montreal Basketball League circles, the Verdunites have blended a crew of veterans and freshmen into what appears at this early date to be a real pennant contender.